CaroLines Creative Stamps: Acetate, Glitter Spray and me! I've been doing a lot of experimenting recently in preparation for the Port Sunlight Stamp Festival next week. I like acetate and I'd already found the Brilliance ink stamps nicely on the rough side of acetate for inkjet printers. It dries well and the pearl shows throught the acetate. I wondered whether the Crafter's Companion Glitter Sprays would dissolve the ink...it doesn't! Here are some of the results...difficult to photograph unfortunately, they look a lot prettier in real life! The butterflies are from the Butterfly Duet range and I used Brilliance Pearl Chocolate, Crimson Copper and Pearl Sand Beige. The outer butterflies were sprayed with the Gold Glitter Spray and the middle with the Irridescent Spray. (I have these sprays in stock, also Silver, but not on line yet...please e mail me if you are interested). 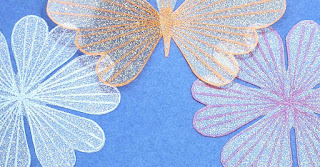 These designs are from the Heartistic Butterflies and Heartistic Geranium sets, sprayed with the Gold and Silver Sprays. Your experimenting has obviously paid dividends, Caroline! Lovely technique. Look forward to seeing you at Port Sunlight!